Anyone else taking deep breaths as we already prep for April? I know it’s a dumb, always asked question, but how the heck is time going by so quickly? 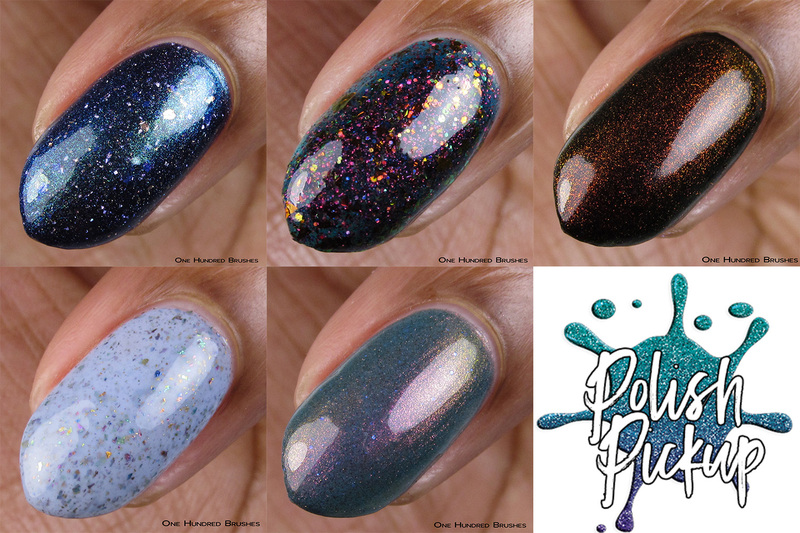 To ease some of that anxiety, I have five gorgeous polishes for April’s Polish Pickup. You will noticed that I’ve taken on a lighter load this month. This in preparation for an ankle surgery I’ll be having and putting some time aside for recovery. 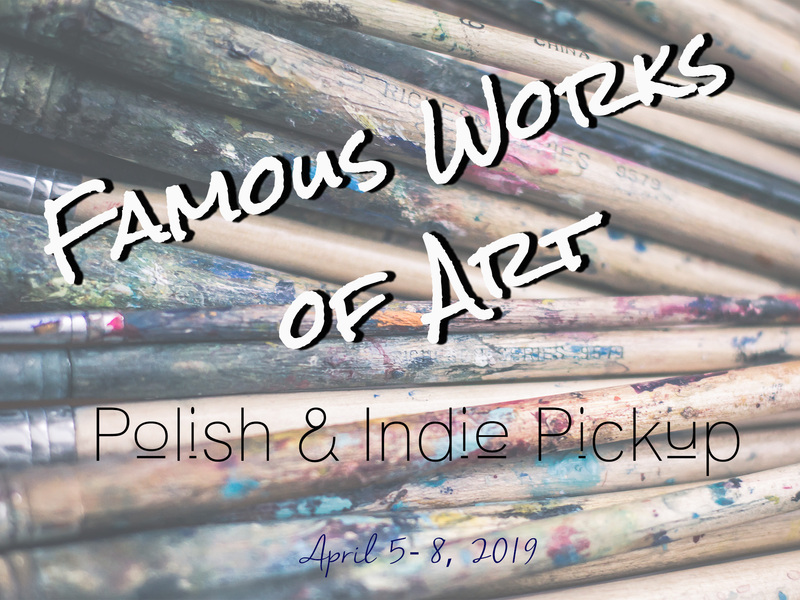 Let’s take a look at what some of our favorite makers have put together for Polish Pick April 2019 – Famous Works of Art! 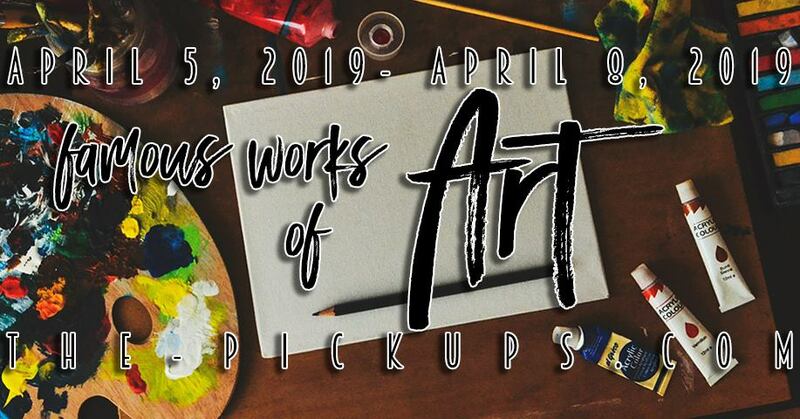 Recently Indie Pickup has been following the same sale and shipping schedules as Polish Pickup and this month, posts from makers are being combined in the Polish Pickup Facebook group. Indie Pickup was created to house most of the extra non-polish items that came along after the explosive growth of Polish Pickup. All your Pickup products in one place! Well, look at this stunner! Cameo prepared for us a gorgeous, shifty multi chrome, under the inspiration of Van Gogh’s Irises. Doctor Who has ruined Van Gogh for me. Whenever I hear of or see a piece from the artist, my mind immediately recaps his episode. It’s absolutely one of my favorites. I’d Give My Ear For An Iris is described as a deep indigo to purple base with a green to blue to purple shift giving it that multi chrome look. Additionally, we spot some scattered holographic sparkle, speckled with a mix of purple to blue, lime to blue to gold, gold metallic, and silver holographic micro flakes. As always, I’m in awe of who seamlessly all the elements come together here fo make this masterpiece. 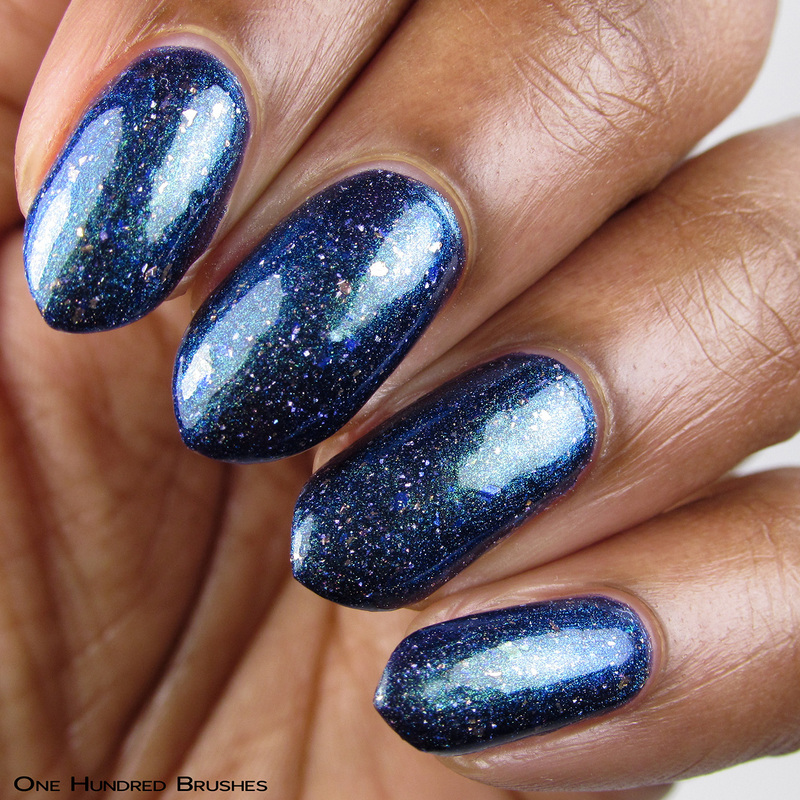 This polish applies with ease and dries to a slightly textured finish. Here, I’m wearing three coats with a glossy topcoat. Sophie was inspired by the artist Zdzisław Beksiński in her creation of Photographing Dreams. Photographing Dreams starts off in a teal jelly base which cradle red chrome shifting flakes, red to green shifting iridescent glitter and a vibrant pink shimmer. 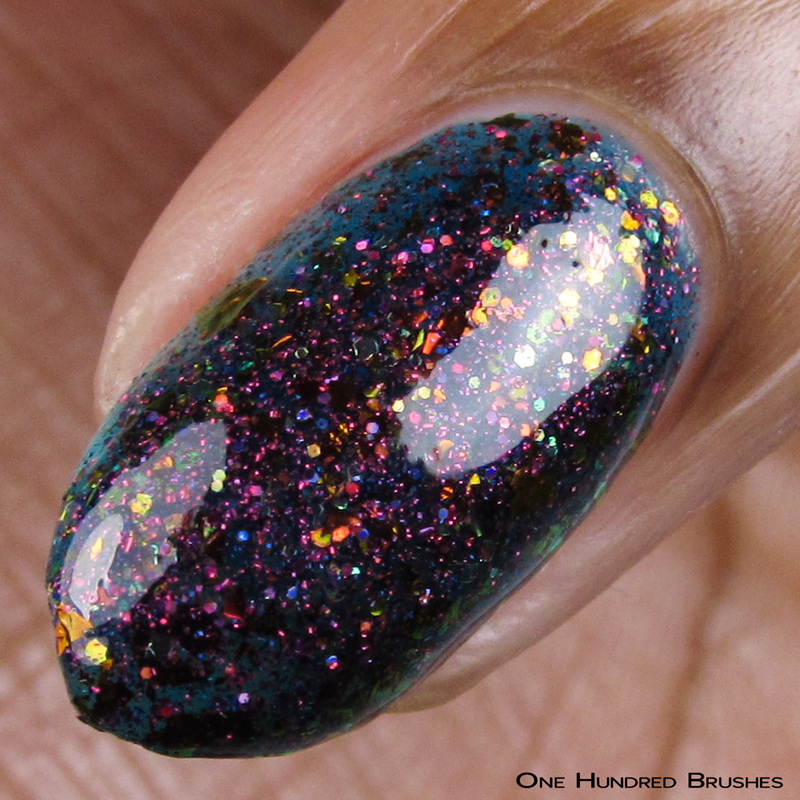 This polish blew me away and I couldn’t wait to wear it next. It’s a lot sparklier than shown here in my pictures with the flakes giving off vibrant color. The flakes are really dense in there, eliminating the need to fish around. There’s a little bit of texture left by the flakes but that is smoothed off with a generous application of topcoat. I’m wearing three coats with a glossy topcoat. And we have a UP topper! Jill’s Desire was inspired by a New Orleans Streetcar painting. I’m loving the double entendre with the polish name here! 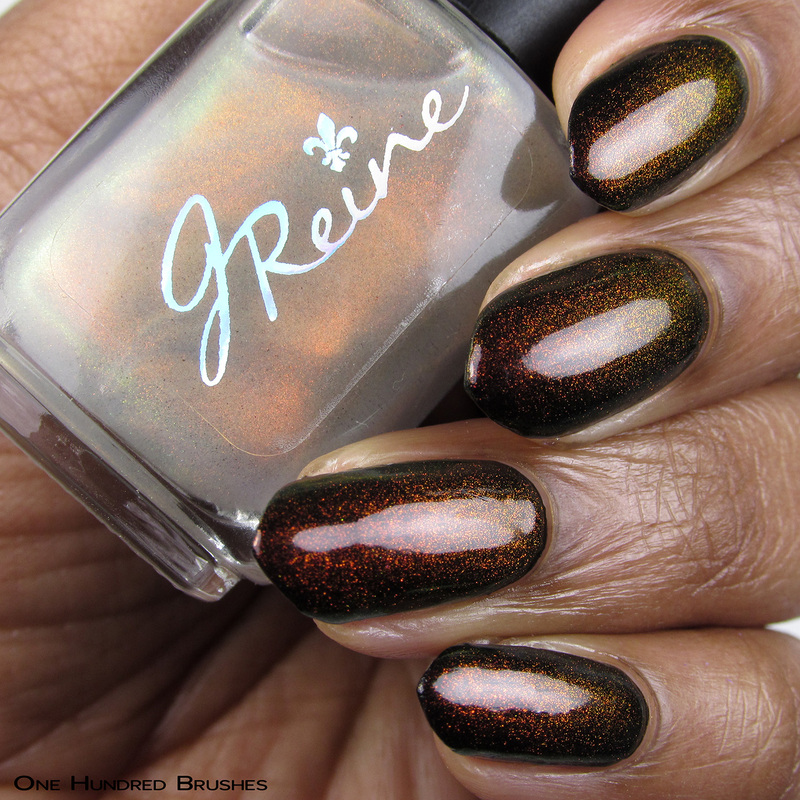 Desire is a clear-based topper that is densely packed with both small and large Original Unicorn Pee pigment. 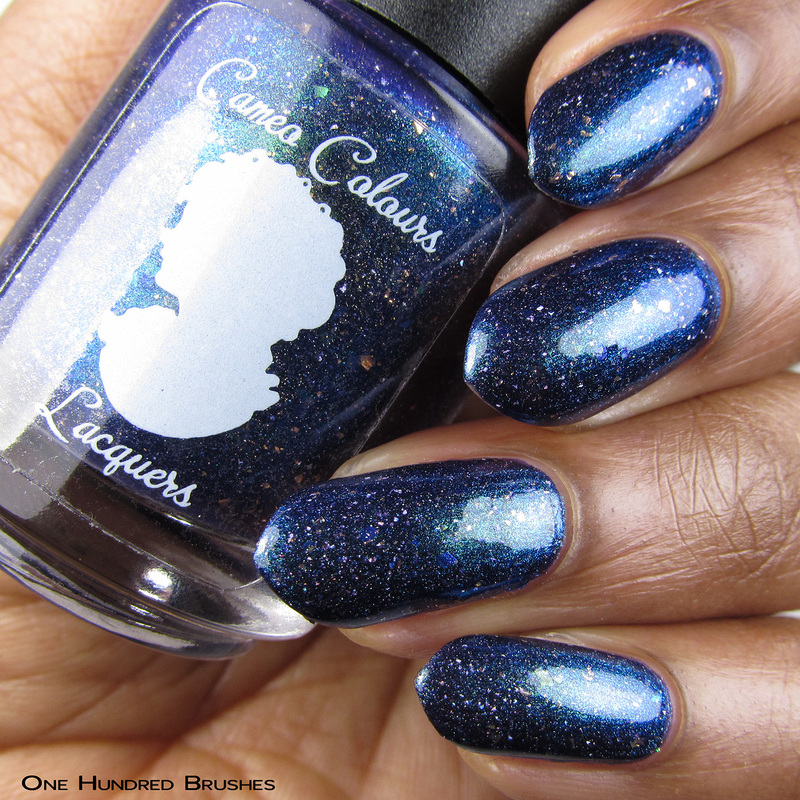 I’m wearing it over black but I know other bloggers and swatchers show it over other shades. Just be sure to look out for that in the Facebook group. 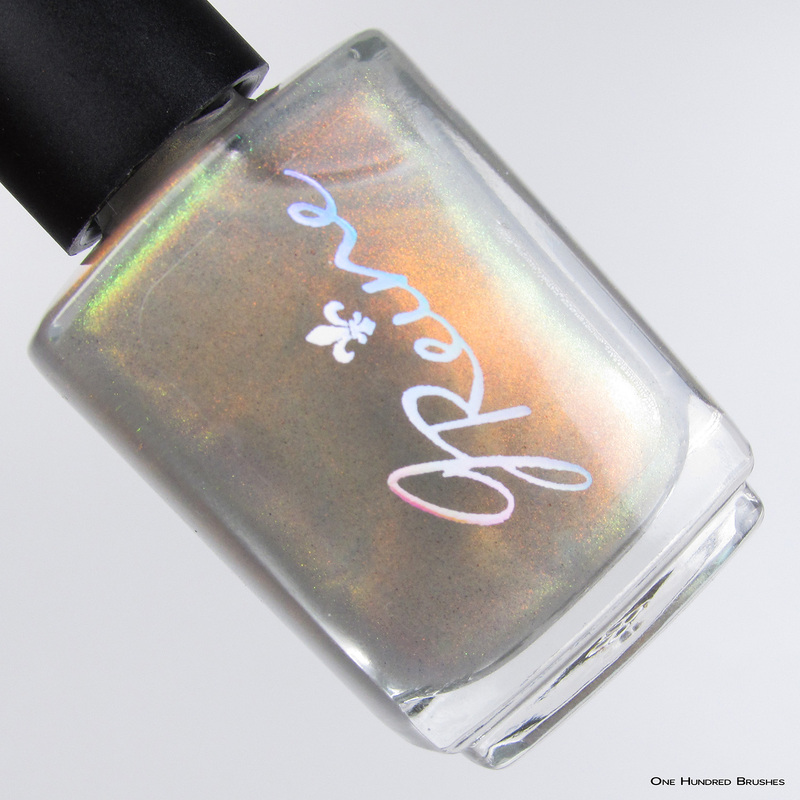 As is signature to UP, there is a gorgeous glow that comes off this polish, easily transforming any base. 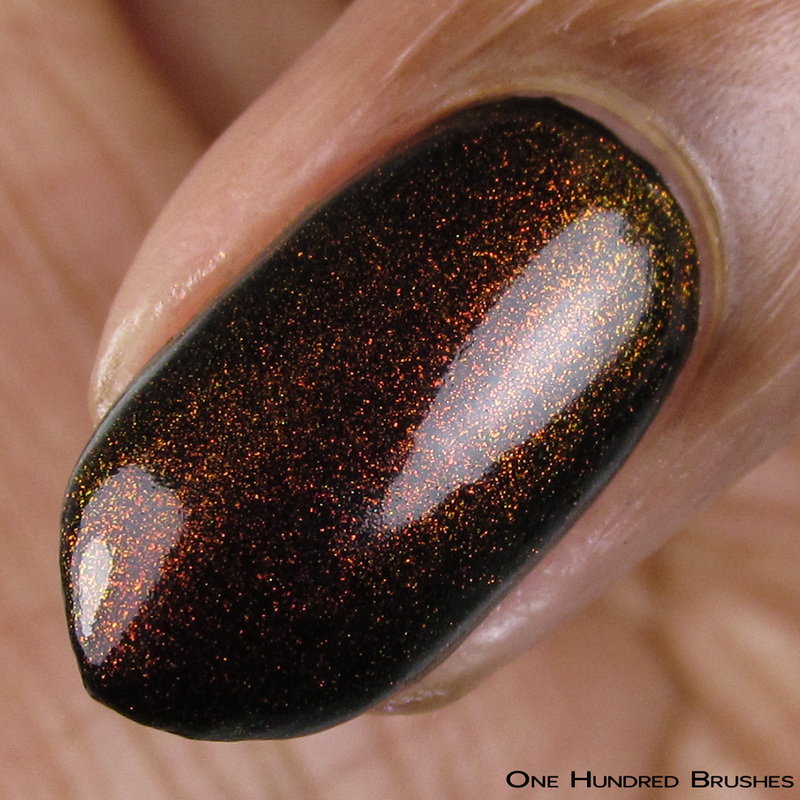 Here, I’m wearing one coat over black with a glossy topcoat. Lexi’s pick for Famous Works of Art was inspired by Claude Monet’s impressionist painting Le Grand Canal. 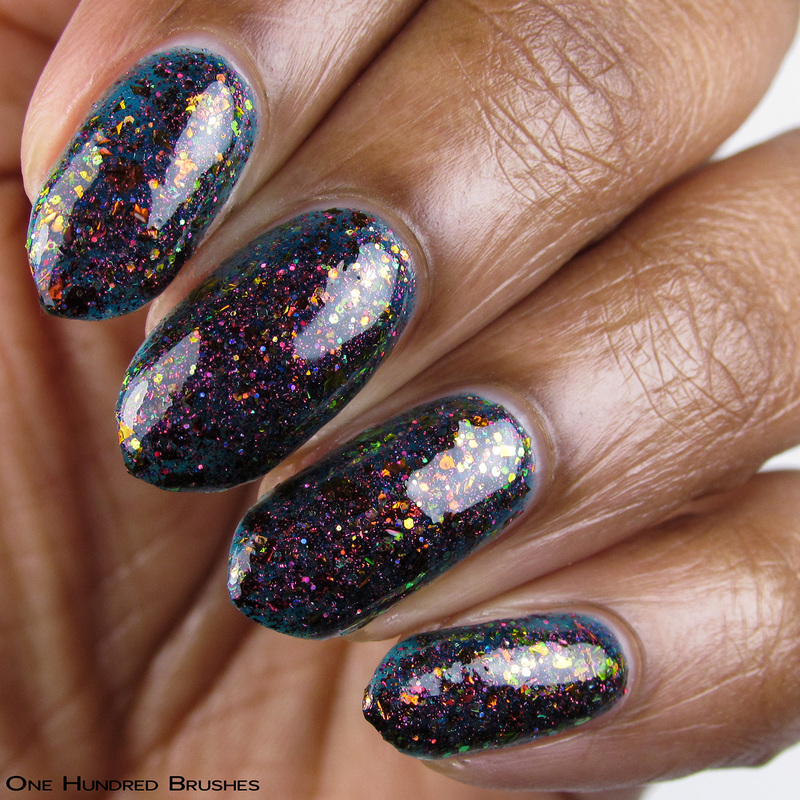 Here, the base is a light periwinkle blended in with rainbow of color-shifting flakes. I’ve been really feeling crelly flakies as of late and this pretty one captures the inspiration beautifully. 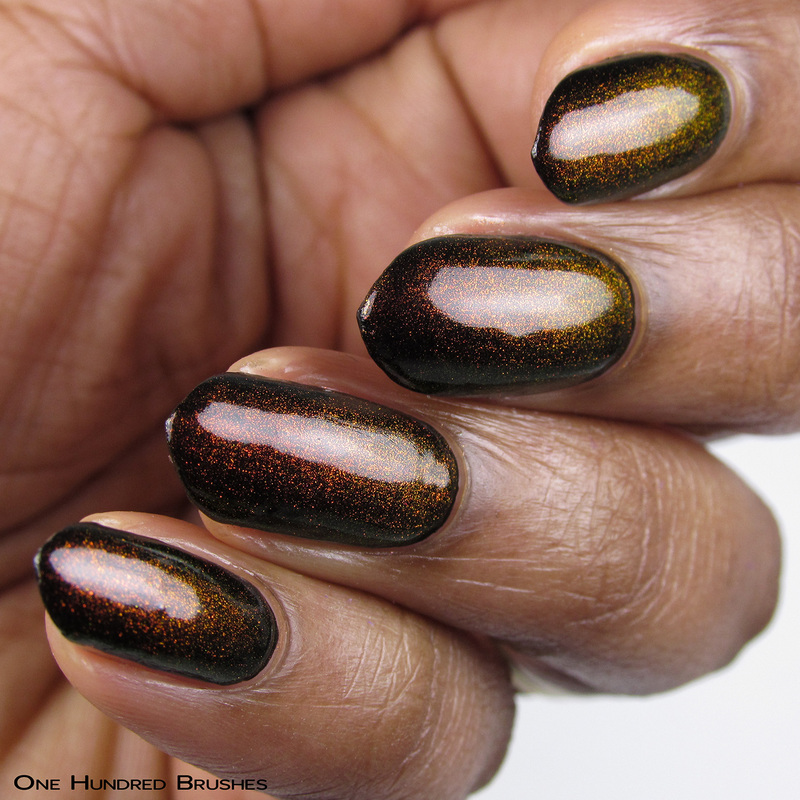 In these photos, I’m wearing three coats with a glossy topcoat. 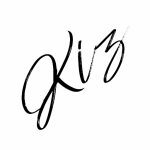 Wrapping things up is this breathtaking number from Kirsten. Don’t Worry, It’ll Blow Over was inspired by the Boreas painting by John William Waterhouse. Here we have a dusty gray blue with a striking mauve to green shimmer and iridescent blue glitter that add a welcomed pop of accenting color. 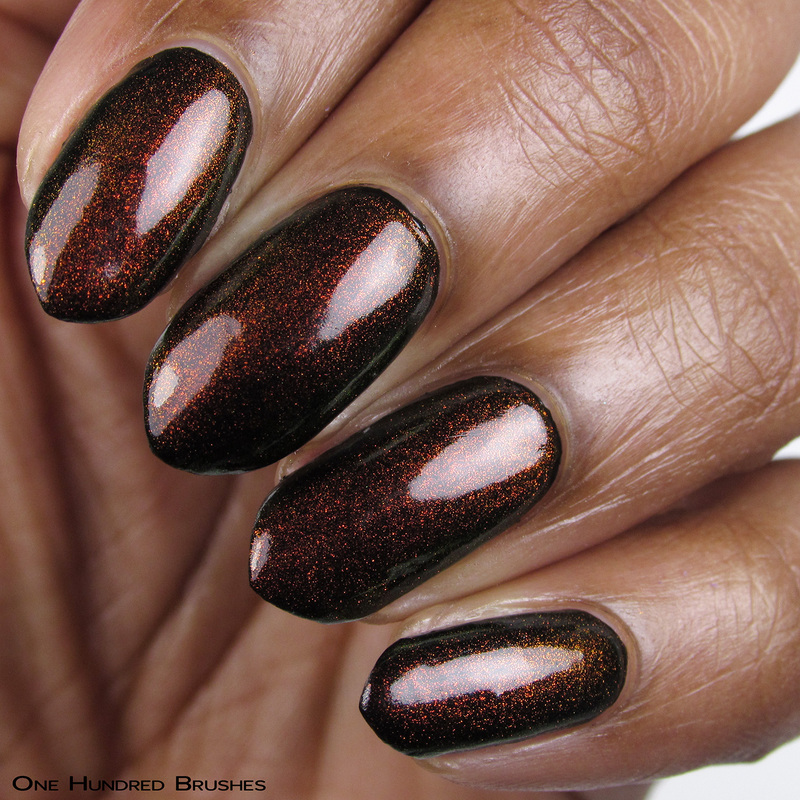 On first application, there is a bit of a sheer quality to this polish and it builds to its full intensity with a smooth application and finish. In these pictures, I’m wearing four coats with a glossy topcoat. As you can see, I have a very small selection for this round. Luckily, they are the ones that came in before having to change my swatching plans. I can’t help but feel like I lucked out in getting the opportunity to show such beauties. Don’t forget to check out Indie Pickup whose items will be available at the same time on the joint Pickup site.